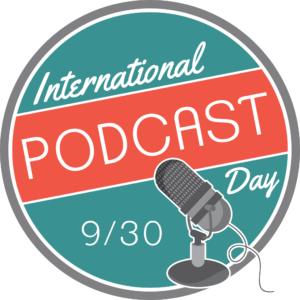 September 30 is International Podcast Day! To celebrate the occasion I have created a special Podcast Day bonus episode where I am going to look back at the past episodes and see what we have heard so far. So what have we talked about? Well as you can imagine we talk about flexible work arrangements a bit. I loved getting Alina’s perspective on flexible work arrangements as someone in the HR field. So I think from the time I interviewed Alina there has been more and more evidence coming out that supports that view, that workers who have the ability to make work and other life demands happen more easily are more productive, balanced and loyal within their workplaces. So when you were listening to Alina speak just then, who were you picturing? Someone you know who is already working part-time? Someone at your workplace who job shares? A friend who does some work from home. Can I ask, was the person you were picturing……female? More than likely it was. “Overwhelmingly when people talk about their flexible work arrangements, it is our work value being expressed in ‘number of hours at work’, where the longer the hours = the more valuable the employee. This metric means that by being at work less (working part-time, or taking time off for kids appointments or events) we are seen as being less valuable, achieving less, and being less committed. If we are trying to work fewer hours we are seen to be slacking off or taking advantage. Quite frankly this metric serves to further the careers of those not toeing the childcare line…..currently, that is mostly men. Because while we are getting more and more on board with women working flexibly to fit in around family responsibilities which is a great step forward if we go back to the introductory episode of Head of a Codfish you may remember how we want males to be in the flexible work picture also. If at the moment we are not seeing men requesting flexible work arrangements in greater numbers, what are the barriers? As I discussed with Meaghan, there are a few obvious ones: the rules not catering for it, and then the culture of workplaces not being accepting of men who choose to take it up, and the men themselves attitude towards part-time and full-time work. We looked more at the cultural and societal barriers faced by men looking for work flexibility with Alina, and I was kind of dismayed to learn that this had shaped the direction both of our families had taken in regards to divvying up the paid work. What is the path forward from here? What do we need to do to help change the culture around men taking a step back from the workplace to allow women the time and energy to lean in without being overloaded? The attitude and examples set by workplace leaders is something that is pretty key to men accessing flexible work arrangements – if a leader has sought arrangements for themselves they are obviously going to see the value in their staff seeking the same arrangements. But I want to also look a bit closer to home for a barrier that may be contributing to men and women being locked into their traditional roles…….mother guilt. Mother guilt is that feeling that tells us women that no one can look after our offspring as well as we can, and we should be doing ‘all the things’ to make sure things are done correctly. It is that feeling that we should be the one who looks after them when they are sick, it is the feeling that we should be doing the school pickups and taking the kids to endless after-school activities and we should be preparing healthy food every meal and we should be keeping a lid on the kids screen time. So why do we have this mother guilt, and what is it good for? Have you seen the movie Inside Out? Remember how we learn that Fear plays a role in keeping Riley safe, Disgust keeps her safe from social disaster, and Anger ensures she is getting her fair share. But when they take over the controls? Total disaster! Mother guilt helps keeps you in check, making sure you are doing a good job at this parenting gig with that nagging thought of ‘am I being a good parent?’. Just like anger or fear, when mother guilt takes over the controls and rules all the decision-making, the person who comes off second best is the mother. We need to keep mother guilt in check and ask ourselves these question – is mother guilt serving us well? Or is it creating a mountain of work that only you can do? Is mother guilt giving you some reasonable information to make solid decisions, or is it running interference and causing bad decisions? Someone with too much anger or too much fear will make decisions that aren’t the best for themselves, and I think too much mother guilt has the potential to do the same. If the list of things ‘only mum can do’ is a long one, there is no room on the list for the things that keep us sane, engaged and learning.